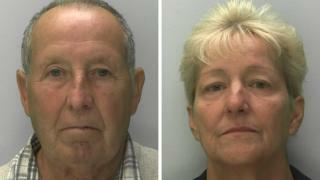 A man who forged his mother-law's will, in an attempt to inherit a share of her £100,000 estate, has been jailed for 12 months. Brian Fairs, 77, copy and pasted a signature from Gillian Williams' will onto a forged document. His wife Julie Fairs was also found guilty of forgery and fraud and was given a 12 month suspended sentence. The court heard Mrs Williams did not want the pair to benefit from her and cut them out of her original will. The judge at Gloucester Crown Court said Brian Fairs, of Abbotswood Road, Gloucester was the driving force behind the offences, and his wife had simply gone along with it. Image caption The court heard Brian Fairs copy and pasted a signature from his mother-in-law's will onto a forged document. Brian Fairs' defence solicitor, Steven Young, said the scheme was "about as far from sophistication as one can imagine". He added that his client accepted he was "incredibly stupid to start the process". During the trial the jury was told Mrs Williams, who died in May 2017, had viewed her son-in-law as "cantankerous and arrogant". In sentencing the couple, the judge, Recorder Mr Ignatius Hughes QC, said it was plain from her wills and conversations with other people, and her attitude to Mr Fairs that Mrs Williams did not want either person to benefit from her estate. "Which is why she had written her own daughter out of her will," he said. The judge said Brian Fairs was "responsible for the dishonour that now falls on you and your wife for what you decided to do".